Current wrestling team members pose with textbooks next to their award flag. From left to right: Sophomores Aaron Mendoza, Flora Chang, and Alice Drozd, Junior Lance Renteria, Sophomore Nikita Dhaliwal, Juniors Isaac Wang and Jared Pingue, Senior Shawn Pham, and Junior Colin Trang. 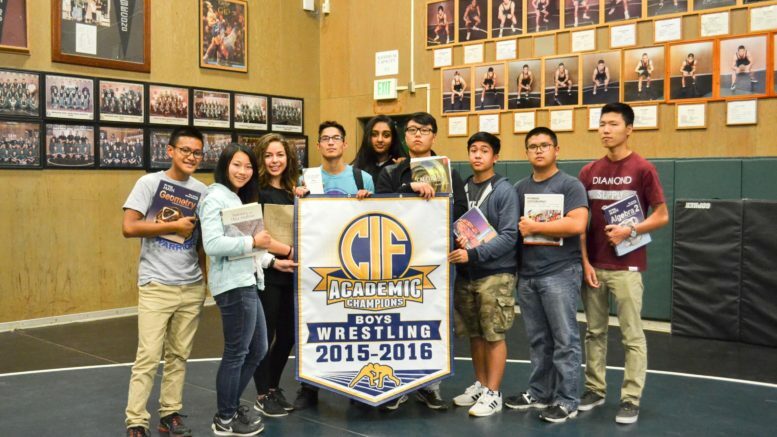 The Wrestling team was awarded the State Academic Team Championship by the California Interscholastic Federation (CIF) for the 2015-16 school year. The team represented the North Coast section with an overall team GPA of 3.81, and ranked 25th out of 32 teams from 10 sections across CA. Representing more than 722,000 student-athletes, CIF is a nonprofit federation that aims to foster student growth, equality, and academic development. To further develop this goal, the CIF State Academic Team Championship Program was instituted in 1996 as a platform to recognize and reward sports teams with the highest overall GPA, based on the unweighted 4.0 GPA scale. Section offices across the state nominated teams across all sports with high athletic and academic achievements, and recommended them to the state office where final winners were determined. After a challenging and rewarding season, Wrestling accepted this award for the third time in the team’s history. During the 2015- 16 season, the team persevered through both athletics and academics with this acknowledgement. Individual team members faced obstacles such as controlling their weight and attending rigorous daily practices, but were able to gain discipline and determination through having to balance wrestling and school. The greatest contributing factor to their achievement proved to be their strong mentality and mindset. Wrestling Head Coach Thomas Thomsen said, “They [team members] meet a lot of adversity in terms of having to practice hard every day for two hours, going home and doing homework and what they need to do for school, and getting up the next day and following the exact same schedule over again, for a three or four-month period. Not a lot of people can do that.” Team members also learned valuable life lessons along the way, including striving to do their best and working hard for everything they are going to accomplish. The team received a congratulatory banner to be put up on display in the school gym. With this award on their record, Wrestlers plan on improving its skills along with its female team in preparation for the upcoming winter season. Be the first to comment on "Wrestling wins State Academic Team Championship"